Do you enjoy entertaining your family and friends in your home? 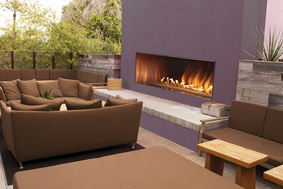 Consider adding an outdoor fireplace as another area of your home to host your guests. The Empire OLL48FP12SN is an outdoor fireplace made at a high standard of quality as are all Empire products. It is a 48-inch, stainless steel fireplace with an operating power of 55,000 BTU. The Carol Rose fireplace has an elegant design to give that overall aesthetically pleasing effect, and it comes with a pushbutton manual ignition. The Empire OLL48FP12SN Carol Rose Outdoor Stainless Steel Linear Fireplace is sure to be a favorite gathering place for those you care about most. Does this fireplace comply with CAL Energy Sec. 150.0(c)? This fireplace does not list that particular code. No sorry we only ship within the continental United States. Does this come with a mantle or kit for the surround? It does not come with a mantle, nor a surround.